`The Prevention Society' is a definition that can otherwise be summarized as: the information society, the risk society, the surveillance society or the insecure society. This book shows the connections and differences between these explanations, whilst providing a gender reading of the ways in which social control manifests itself through precautionary measures. Today’s diffuse and pervasive prevention imperative symbolizes both a self-defining doctrine and the justification for a means of repression, segregation, and exclusion. 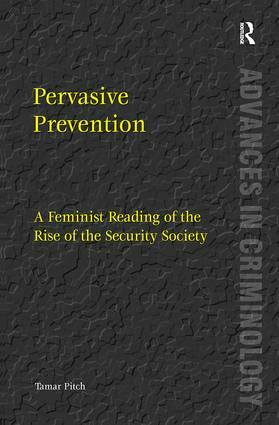 From bodies to daily life and preventative war, Pervasive Prevention investigates the effects of this imperative for social control, its connection with neo-liberal hegemonic ideology, and the centrality in its dealings with women and the feminine. Tamar Pitch is Professor of Philosophy and Sociology of Law in the Faculty of Law, University of Perugia. She is co-editior of the journal `Studi Sulla Questione Criminale'. Her recent publications include: `The Gender of Security: Women and Men in the City; and Fundamental Rights: cultural diversity, social inequality, sexual difference'.